The French Revolution and its long aftermath has inspired some of our greatest and best loved literature and theatre from Charles Dickens’ “Tale of Two Cities” to Peter Weiss’ “Marat Sade” to Victor Hugo’s “Les Miserable” (and of course the musical adaptation by Boublil and Schönberg). Gary Graves wonderful contribution, “Red Virgin,” fits well into this august company. Set at the time of the Paris Commune in the Spring of 1871, it follows the experience of Louise Michel (the titular “Red Virgin”), as she joins the socialist revolutionaries in their attempt to overthrow the French government at the end of the Franco-Prussian War. The story of the Paris Commune is one of European history’s most thrilling, and “Red Virgin” delivers it with inspired grace and breathless excitement. 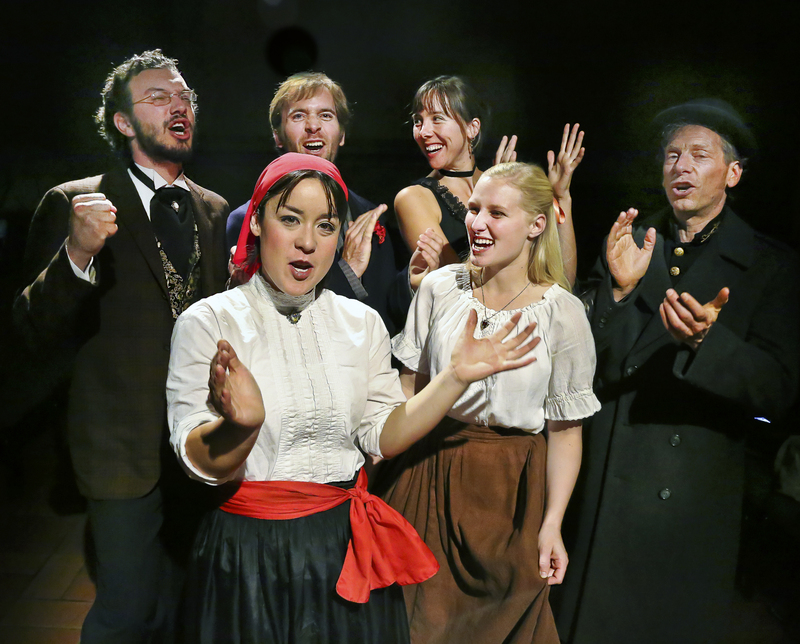 The socialists of Montmartre break into the song It’ll be allright (Ca ira), upon hearing of the defeat of Emperor Napoleon the Third in Central Works production of RED VIRGIN, a new musical based on the story of Louise Michel and the Paris Commune of 1871. Clockwise from the top left: Kenny Toll, Galen Murphy-Hoffman* , Diana Strong, Josh Pollock, Juliana Lustenader and Anna Ishida. Photo Credit: Jim Norrena. We are first introduced to Louise Michel as a young woman and devoted educator, running a country school for girls where censorship is ignored and both patriotism and revolutionary ardor are encouraged. Anna Ishida offers an astonishing and moving performance as Louise. Her eyes sparkling with fervor, she is passionate, convincing, inspiring and frightening. It is easy to believe that she is capable of taking up arms and killing the enemy in battle and far too easy to cheer her on. As the sweep of events catches her up, she rushes to Paris to join the revolutionaries, followed by her student Clemence (Juliana Luctenader). What follows is a marvelous history lesson as Louise encounters Theo Ferré (Galen Murphy-Hoffman) and other revolutionaries, convincing them that women can fight as well as men, and organizing the working women of Paris to prove her point. The fervor of the revolutionaries is almost irresistible, and our engagement is further assured by a rousing score of new and traditional music selected and arranged by Allison Lovejoy. Lovejoy’s musical direction is varied and sophisticated and the cast of singing actors are all in superb voice. Diana Strong provides excellent accompaniment on the accordion as well as performing well as a member of the ensemble. We know from the beginning that the revolution will fail and the communards will be crushed, with Louise condemned to live out her days in a foreign penal colony. History tells us that 20,000 communards were put to death by a vengeful government. That government is here represented by the character of the Marquis de Gallifet, played with impressive range and subtlety by Josh Pollock. Although clearly a villain, in Pollock’s skillful hands, we are led to understand how Gallifet views the communards and to share his horror at their brutality. This play does not take sides, and it is difficult to clearly identify heroes and villains. The script does impressive justice to this complex historical tale. For some, the Paris Commune represents the first great experiment of a government of workers, an inspiring moment in the history of workers’ rights and justice for all. Others will find in it a cautionary tale of the dangers of unbridled idealism coupled with violent but misguided action. Director John Patrick Moore has done an amazing job with his ensemble of six actors, convincing us to suspend our disbelief and imagine we are watching thousands in the midst of a massive uprising. Tammy Berlin’s excellent costumes help create the illusion of reality. Audiences will leave the theatre profoundly moved and with a great deal to think about in matters of politics, passion, right, wrong, revolution, history and how we move in it and are formed by it. This is an exceptionally successful, thoughtful, thrilling and admirable production that ought to be seen. “Red Virgin” by Gary Graves, world premiere presented by Central Works. Director: John Patrick Moore. Musical Director: Allison Lovejoy. Lights: Gary Graves. Costumes: Tammy Berlin. Louise Michel: Anna Ishida. Clemence Enjoiras: Juliana Lustenader. Theo Ferré: Galen Murphy-Hoffman. Marquis de Gallifet: Josh Pollock. The Accordionist: Diana Strong. Raul Rigalt: Kenny Toll. Posted in Reviews.Tagged Allison Lovejoy, Anna Ishida, Central Works, Charles Kruger, Diana Strong, Galen Murphy-Hoffman, Gary Graves, John Patrick Moore, Josh Pollock, Juliana Lustenader, Kenny Toll, Red Virgin, theatrestorm.